It’s been 14 years since Love & Basketball came out, starring Sanaa Lathan and Omar Epps. Now the writer-director behind that seminal film finally has another love story hitting the big screen. Gina Prince-Bythewood’s Beyond the Lights makes its U.S. premiere Thursday in New York City at the Urbanworld Film Festival. As one of Hollywood’s few African-American female writer-directors, Prince-Bythewood tells The Root that she is passionate about the purpose behind Urbanworld. “With this industry we are in a very interesting time, and it’s just very important to get some new and diverse voices making films, and this festival is such a great opportunity to discover those new voices,” Prince-Bythewood says. The festival’s 2014 ambassador also says that she is looking forward not only to discovering new talent but also to seeing some familiar faces, such as Issa Rae—and watching a few films, if she can squeeze them in, including Difret, Isa and In the Morning. The festival, now in its 18th year, strives to fill a void, says Gabrielle Glore, the executive producer and head of programming. “We’re truly out there trying to redefine and advance communities of color across platforms, whether it’s film, TV or Web,” says Glore. It offers five days of films, panels, parties and programming, all with an urban connection. Some of the other highlights include an evening with Zane and the men of the film Addicted and a sneak peak at Ava DuVernay’s Selma. Beyond the Lights is sure to steal a great deal of the spotlight during the festival. At its core, the film is a love story about a talented young singer, played by Gugu Mbatha-Raw. She is pushed into superstardom by her stage mother, portrayed by Minnie Driver, and then saved from self-destruction by her love interest, played by Nate Parker, with Danny Glover as his father. Prince-Bythewood says she wanted to do a music-themed love story, and the idea came to her while at an Alicia Keys concert. “It’s one of those great moments as a writer. I was sitting there and she started singing ‘Diary,’” says the filmmaker. To make sure Mbatha-Raw and Parker would have undeniable chemistry in the film (as was the case with Love & Basketball), Prince-Bythewood had them go out on a date. Then she surprised them by having 30 paparazzi show up. “It was just a cool bonding moment to build the characters,” says the filmmaker. 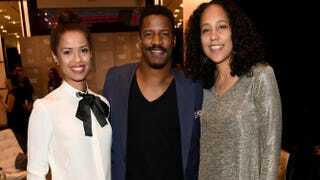 With two love stories under her belt, the next film Prince-Bythewood is working on is about the friendship between three girlfriends. After that, she says, she has another love story that she wants to do. Next time, Prince-Bythewood promises, there will not be a huge gap between her films. “The goal is not to take more than two years to get this one done and out,” says the writer-director with a self-deprecating laugh.